I was driving home the other night after attending a graduation celebration for Leadership Wood Buffalo, a program that I went through four years ago and an organization that I belong to today as a member of its board and alumni. It was 11:30 pm, a rare late night for me. As I came down the big hill into the valley to the lower townsite, the sky was still somewhat light on the northern horizon. Considering that the area had some snowflakes just a short week ago, the days are suddenly incredibly long. 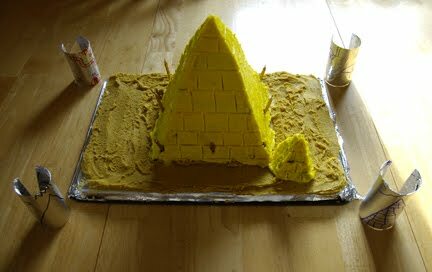 Ben turns 7 today. Hard to believe, as it seems like yesterday that he popped into the world. In our minds we thought he was going to be a girl. Our plan was to call the potential "her" Benna, so, we just lopped it off and went with "Ben". 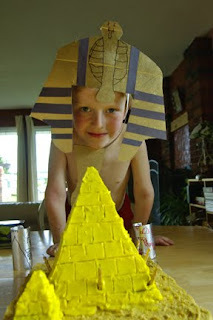 Since returning from Mexico, he has been going through an Egyptian phase. His grandparents were here a few weeks ago and helped him build and design a sarcophagus, which he sleeps in faithfully almost every night. 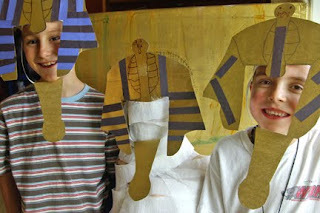 His party consisted of making Egyptian arm bands and headdresses. 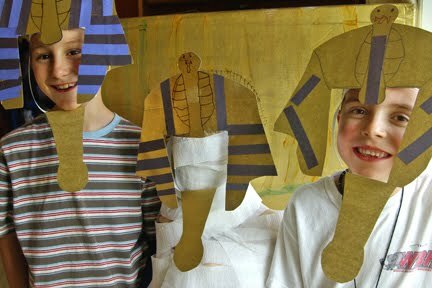 Then his friends got to wrap him up into a Mummy! He loved it. That's him in the middle up at the top of this blog post. We have an angel in our life named Tiffany who made an incredible pyramid birthday cake. Golden yellow with a desert base made of a sweet maple fudge, it was an outstanding creation. Heather had a dream the other night about teaching yoga down in Mexico. I'm not sure if that will prove to be prophetic or not. Today, she begins of weekend of teaching as she's hosting a Laughter Yoga Weekend down in her studio. Have you heard of laughter yoga? Now there would be a fun and healthy activity for groups of strangers at a Sandos resort. Early spring has given way to late spring as the lawns are deep green, the delights in the garden have popped out of the ground and the leaves on the trees have returned in earnest. We hope your rain has given way to sunshine for the weekend. All the best from all of us in Wood Buffalo!